This snare embodies all of the qualities that WorldMax has become renowned for; it’s well built, looks great and plays wonderfully. Very few, especially for the money. Taiwanese brand WorldMax has earned a well-deserved reputation for its keenly-priced snare drums. 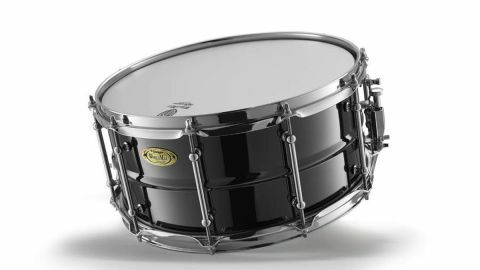 From the company’s ranks we have a Black Dawg 14"x6½" black nickel over brass shell snare for review. WorldMax manufactures more than one type of brass-shelled snare and this particular model is from the company’s most affordable line. The drum has undoubtedly been inspired by Ludwig’s legendary Black Beauty snare, hence the tongue-in-cheek Black Dawg moniker. The beaded brass shell is 1.3mm thick and has been expertly black nickel-plated and then polished, making for a flawless appearance. The finish is not just about looks - the black nickel also influences the response of the drum, adding a degree of darkness and focus. A tidy weld is only visible on the inside and the shell is also exceptionally round with a divergence of only 1mm over the entire circumference. Bearing edges are folded over at 45 degrees with generous snare beds incorporated into the resonant side. Ten chrome double-ended tube lugs encircle the shell while 2.3mm triple-flanged hoops (again in chrome) tension down onto Taiwanese-made Remo heads. Brass is an inherently warm and musical alloy - that’s why an entire orchestral section is named after it - and the qualities it brings to wind instruments are also present in drums. Straight out of the box this snare rings true in all the right areas. Tuned up it gives an ear-popping crack, while lower down it delivers irresistible crunch; midway between the two finds a near-perfect blend of both characteristics. Brass typically manages to cut through without sounding harsh, and that’s definitely the case here - it’s loud and authoritative but there’s a sweetness present. The drum’s generous 6½" depth, meanwhile, means that the note is always full rather than sounding snappy. We took the snare on a dep ska gig where we cranked the batter head up to biscuit tin tensions. By flicking the snare wires off we used it as a makeshift (but convincing) timbale at points in the set. The slightly sticky action of the lever was the only obvious clue to its humble pricepoint - sonically, it hit the spot.